Hi, I am interested in your 1970 Chevrolet Chevelle (stock #5086-CHA) listed on Autotrader for $63,995. I'd like to get more information about this vehicle and confirm its availability. When you love the muscle car era, you go looking for a car like this. Heres a 1970 Chevrolet Chevelle 454 with all the right Super Sport indicators. So dig into all the details where youll find great upgrades that add flair, and yet it never messes with the original numbers-matching LS5 big block heart that gives it timeless appeal. The red paint is a later upgrade on this coupe, and we always love it when a big block Chevelle looks like its out for blood. You can tell they took their time with this application by the way the gloss radiates in the sunshine and highlights the curves in one of the coolest hardtops to hit the streets. We know you also love this ones dark side with the blacked-out grille, dark rear bumper insert, and the full-length painted SS stripes. This intimidation factor is turned up further with all the correct Super Sport pieces, like the badging, hood pins, and a proper cowl induction hood. Against all this aggression is also the right amount of flair with the form-fitting chrome bumpers, full bright trim, and Mag-style SS wheels. We love it when the exterior accents are a preview of the interior color, and honestly, its hard to beat a black interior against the bold red exterior. With something so correctly finished and plenty of interior room, this is the kind of classic youll happily share with family and friends. Then again, with high-back bucket seats, center console, and a grippy SS steering wheel, you already know this one is all about the driver. This one has all the best sporty features like the horseshoe shifter and the U14 full gauge package that includes a large speedo and tach. Under the hood is the numbers-matching LS5 454 cubic-inch V8. Those who know these Chevelles, also know this is a major indicator of a genuine SS 454 car. It has all the right pieces in place, like the bold orange block, bright valve covers, and the gasket around that air grabber to seal it to the cowl induction hood. Plus, it has all the other correct Super Sport features, including boxed control arms, suspension brackets, a 12-bolt rear end, and sway bars front & rear. So youre going to love showcasing all the pieces that make this a proper street king, and these are the same components that give it confidence on the road. This one is quite easy to show off. The four-barrel carburetor lets the V8 inhale deeply for power, and the H-pipe dual exhaust gives that great big block rumble. Plus, power steering, front disc brakes, and a stout TH400 three-speed automatic make this intimidation machine a terrific cruiser. 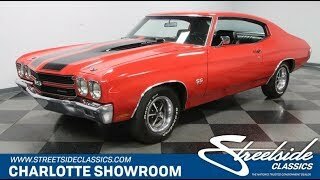 Complete with owners manual, this is the Chevelle SS that really knows how to impress with its bold looks and classic features. So its the always in-demand classic you can take home today. Call now!